By John H. Watson, M.D. Philip José Farmer’s The Adventure of the Peerless Peer WAS ONLY THE BEGINNING! In 2016, Meteor House published its first limited edition chapbook, Win Scott Eckert’s Being an Account of the Delay at Green River, Wyoming, of Phileas Fogg, World Traveler, or, The Masked Man Meets an English Gentleman. 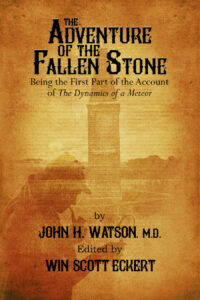 Now, Meteor House is proud to introduce its second chapbook, The Adventure of the Fallen Stone: Being the First Part of the Account of The Dynamics of a Meteor, chronicling Sherlock Holmes’ ongoing efforts to combat the hellish hun, as recounted by the Great Detective’s Boswell, Dr. John H. Watson, and edited for publication by Win Scott Eckert! Thrust back into the shadowy fray of Great War espionage, the detective’s brother Mycroft sets Holmes and Watson on the perilous trail of a cunning German mastermind. Join Holmes, Watson, sleuths Harry Dickson and J. Saxon Blake—intriguingly, both master detectives with digs on Baker Street, who greatly resemble Holmes in demeanor, speech, and aspect—and the alluring Isis Vanderhoek as they race across England in pursuit of a master villain and a stolen flower with remarkable medicinal properties. WHAT is the mysterious lotus vitae? HOW is it related to a meteor that fell in Yorkshire in 1795? WILL Holmes and company success in preventing the nefarious Von Bork’s latest scheme? Meteor House is proud to present our second limited edition chapbook, a 24 page, 8,650 word adventure signed by Win Scott Eckert. As with most of our books, the print run will be determined by the number of books preordered. Only a small number will be printed beyond the preorders, so to ensure you don’t miss out, be sure to preorder no later than March 10th! Why the short preorder period? Win will sign these chapbooks at an event on March 25th at Fleur Fine Books in Port Neches TX. We can’t guarantee there will be any copies left by the time we get to FarmerCon XII (at PulpFest) in July.